Think of the words ‘Power’, ‘Precision’, and ‘Innovation’ and it’s likely that Honda will be one of the names that come to mind. Known for their super reliable and efficient cars, as well as motorcycles, and boat outboard engines, you can be sure that if they’ve designed a petrol driven lawn mower it will be more than up to the job of cutting your lawn. 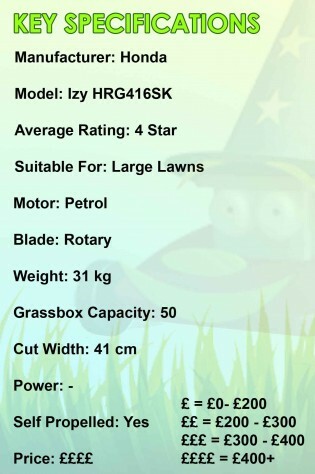 So with such high expectations in mind let’s take a look at the ‘Izy HRG416SK’ lawnmower and see exactly what it can offer. The first thing to note is that this mower is self propelled, meaning a much less strenuous job for you, and it has the essential safety feature of halting both the mower as it drives forward and the action of the cutting blade should you let go of the handlebar. Other features that almost go without saying are a decent sized grass box (50 litre) which is essential for optimising cutting time and reducing time spent emptying grass, and a range of 6 incremental cutting heights. 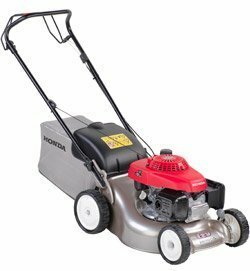 One of the stand out features that the Honda engineering team have been busy perfecting with this mower include an improvement to one of the greatest nuisances associated with lawn mowing, the noise it generates! Thanks to some clever wind tunnel experimentation, a new blade design means that not only is the noise generated by the mower cut by 30% compared to it’s predecessor, but it also improves the cutting and collecting ability of the mower. 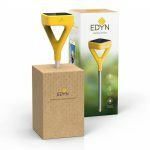 To aid in the air flow and guidance of grass into the collection bag, the design of the cutting deck has also been carefully considered. Using their expertise of outboard engines for boats, Honda have also developed an ‘auto choke’ system that means that mower will start in all conditions, and automatically open when the engine starts, and close the choke when the engine cools. What this means for you is easier mowing and improved engine performance, and that can’t be bad. will struggle to cut very long grass over 100mm or so, likewise it isn’t very effective on damp grass, but what mower really is? It’s certainly true that a lot of engineering thought has gone into designing this machine, and it really shows, the features really make for about as optimised a cut as you could hope for. It’s not completely without fault however, and some people would argue that the level of optimisation is a bit gimmicky, and really overkill considering the application of the engine, after all it’s not necessary to be used with the level of endurance as vehicles or boats. In short this mower will do everything you need, and more, it’s just whether you consider the ‘more’ completely necessary. I bought an HRG4165K in May 2016. It has been nothing but trouble. As I write this I am dripping with sweat after spending 15 minutes trying to coax it into life. Every week is the same. Some weeks it jams too, so I can’t even pull the cord. Today it was jammed. . I bought it because my previous lawnmower was rubbish but its Honda engine started first pull every time, even for the first mow of the spring. THAT engine lived up to the lavish praise here. “No worries,” you might think, “It has a five year warranty.” Well try to find a dealer offering less than three weeks turnaround, on a brand new mower. It won’t happen. When I do get it fixed this so-called “easy start”, HRG4165K, with its abysmal auto-choke is going on the local notice board with a £50 price tag just to get it out of my life.